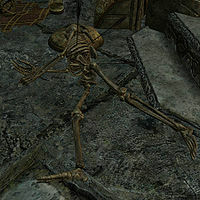 Sinderion's remains are found in his field laboratory in Blackreach, underneath Alftand. He was searching for more specimens of crimson nirnroot, but the area's inhabitants clearly did not share his enthusiasm for botany, as he and his journal are riddled with arrows. Sinderion first appeared in Oblivion. This page was last modified on 30 May 2018, at 21:52.